I was living in a Block on the opposite side of the street in Berlin 2 years ago. Living there remind me of my early childhood in Riga where we had nearly the same Bocks. I think Alexei Paschitnow, the inventor of Tetris, had kind of the same Idea as me in spring 1984. I bet he was looking out of the window of his Block in Moscow and thought >>how do soviet architects actually plan this buildings?? The exhibition consists of a mock up of an entrance to a Soviet apartment block. We’ve printed 8000 newspapers, when they’re out (the biennale runs until January) there are still 6 newspapers on stick. As our space is located at the exit point of the “collective city” exhibition, the idea is to build a portico entrance in the space, either at the exit from the rest of “collective city” exhibition (conceptual coherence) OR as the exit into the stairwell to the rest of the “open city” exhibition (visual coherence? – exit into the stairwell). A stack of newspapers will allow visitors to take home the content of our exhibition, while newspapers in the rack will be for on site consumption. > The boys have lived in Veshnyaki their whole lives. > They spend their free time hanging out at shops like Kwartal and McDonals, at Kuskovo, visiting computer gaming centers in the neighboring rayon or driving around with their older friends. While taking a final stroll through Veshnyaki, we spotted a group of teens (a few boys, and a few pretty girls looking a bit older, 14-16 years of age). After a short hesitation, Inara approached them with some questions. At first they were timid and refused to be photographed, but in less than a minute they were ready the scoop on Veshnyaki. It turned out that all of them, excluding Vitaly, study at the same school as Sergey’s son. They enjoyed it there because it was tough and interesting. Vitaly commented that he liked his school better because it was more lax. When we asked if they wanted to stay in Veshnyaki after they finish their studies, the boys vehemently answered, no, but the girls checked them by commenting, “hey, what are you saying?” They eventually asked us to take a group photo of them and proposed to show us around Veshnyaki. The girls left us and the three boys, led by Vitaly accompanied us to the “worst” place in the area, “the 27th”. It was not hard to see that Vitaly and his friends could have the same future as some of those we met at “the 27th.” Perhaps it is good that they answered “no” so quickly when we asked them if there was some future for them in Veshnyaki. We meet two ladies (36-38 years old) watching their kids play on the playground. At first they refused to talk to us. Apparently, they thought that we wanted to administer a psychological questionaire, or that we were interested in selling something, i.e. internet. When we explained that we were architects investigating Veshnyaki, they started to talk right away. “Actually we like our microrayon. It is green and quite clean.” Some complaints they had concerned noise coming from highway MKAD, maintanance (years ago they were supposed to install a small fence around the playground where we were talking, mostly to protect the playground from dogs and their owners) and that nobody really cares about the trees (the one just next to the playground is leaning more than 45 degrees). True, there many playgrounds in Veshnyaki, but they could be better. Other microrayons, for example are made out of a sort of plastic composite (which makes them safer for kids compared to metal). Some also have playgrounds for different age groups, i.e. built for different heights. We met the guys we contacted through Vkontakte on Tuesday evening. There were three 20 year olds, born and raised in Veshnyaki, and had all attended the same school. They said that they are satisfied with the neighborhood, and why shouldn’t they be? It is a quiet, green district and the area between Rainbow and Kuskovo (the park next to Veshnyaki) cover enough territory for them. There is no industry here and thus is not a concrete forest of buildings like in Mar’ino. They think that it’s such a quiet place that not all Muscovites know where it is on a map, though they may have heard of it. 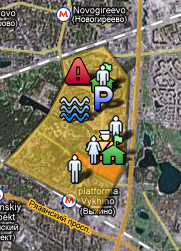 Veshnyaki is somehow lost between two final metro destinations. Generally it seems that life stands still in Veshnyaki: the composition of the population never changes, the old residents of Veshnyaki don’t leave the district, and there are almost no apartments to rent. Nikita recognizes over 90% percent of his neighbors by face and can greet 60% by name. New buildings are hardly ever erected here and that’s why there are no newcomers, though Veshnyaki could be attractive to outsiders because of the public space improvements that were carried out in the last few years: they started renovating buildings, the streets are clean, and they have renovated Kuskovo (now there are weddings there all the time). The most important change has been to the surroundings of Rainbow. Before the major changes initiated in 2002, no one hung out here. Around the lake there were only a small path with two benches and no lighting or concrete; only babushkas walked there every once in awhile. Nowadays, Rainbow is the center of the whole district. During the day, babushka’s, children, and mothers visit rainbow. In the evening it is the territory of the youth. It is at Rainbow that they learn the unofficial stories and myths of Veshnyaki. In the past, there were many battles over rainbow, but they ended about one and a half years ago. All microrayon gangs wanted control over this area. The boys go on to talk about the rivalry between Northern and Southern Veshnyaki. The Northern part defines itself as the “true Veshnyaki,” while the southern part sometimes calls itself Vykhino. In retrospect, it is no surprise that we heard the term Vykhino more often than Veshnyaki when we visited Quarter 79. Nikhita also proudly tells us that though the name Vykhino carries criminal connotations, the guys from that area are actually weaker than shy guys like himself and his friends from Quarter 78. In harsh battles with the North, they lost Rainbow. It was interesting to learn from Nikhita and his friends that identification of territory is not towards the whole “north” or “south” but rather to the smaller entities of microrayon, and that the rivalry between these microrayons can be as intense as with other districts. Nikita then gave us two examples of past battles between adjacent Quarters 77 and 78. The first battle was initiated when one of Nikita’s friends was injured by knife. In retaliation, they unleashed terror in that Quarter 78 and “all of the people who were connected to the incident were punished.” From then on, the perpetrators are no longer allowed to cross the border to Quarter 78. Another time the guys from Quarter 77 harassed a girl from their quarter. After that, the heaviest battle took place. This battle did not proceed according to street rules, and everyone took all the weapons they had and it was a free for all. Nikita explained that all of this is done to maintain control over the territory and preserve safety in microrayons. However, this implies that inhabitants are required to behave in a proper manner; for residents from rival microrayons, even proper behavior does not guarantee safety. Though there are police, they are not efficient. In neighborhoods with so much greenery, it is too easy for gangs to hide, so actually the police cannot infringe on gang relationships. Finally, Nikita tells us a bit about his Vkontakte initiative. The forum was started one year and three months ago just for fun. Quickly it started attracting people: first friends joined, then friends of friends, and finally strangers. Three months later, the first Veshnyaki meeting took place. 70 people attended from mainly the 16-28 years of age. They had some drinks together and gave short introductions. The intensity of the forum slowed after the first meeting and the consequent meetings attracted a bit smaller groups. Nowadays, there are about 8-10 hits per day, and the forum is primarily used for personal messaging. This main consequence of the forum has been new friendships. The people they didn’t know, they now know. They have plans to join the official Veshnyaki administration’s website, this would be a new step in communication between the real people and the administration. The Social Housing After the Soviets is a comparative study of the oppurtunities and the urgencies of public and private use of the Microrayon, the large-scale social housing projects developed throughout the entire former Soviet Union.